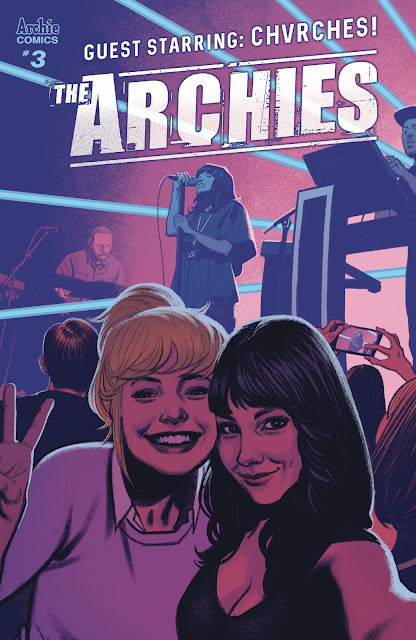 The Archies are cutting their teeth on the road and working out the kinks of their relationship as the band runs into the synth-pop band Chvrches. Like any young band traveling the country, playing any venue that'll have them, paying their dues, and trying to make a name for themselves, The Archies are finding the journey to be very challenging. When their hotel isn't in flames or a credit card is canceled, it's the interpersonal dynamics that take center stage. 'The Archies' #3 is told from Betty's perspective and her blossoming as a songwriter threatens Archie's delicate ego. Alex Segura and Matthew Rosenberg weave a fun story intertwined with a lesson about being a supportive team player instead of a selfish dictator. The band is so much a part of Archie's personality that it bears his name. But it's still a collaborative effort to make the music that has brought them this far. Their first radio spot finds them scrambling when the DJ asks Betty for a new song and reluctantly but spectacularly performs it. The band's surprised but supportive except for Archie who thought they should stick with his music as planned. The sulking redhead learns a lesson when they keep running into the band Chvrches. Having real people or in this case, a real band cameo in an Archie comic is nothing new. They've crossed paths with everyone from KISS to the Punisher. And instead of merely appearing at the radio station, Lauren Mayberry, Iain Cook, and Martin Doherty from Chvrches play a more integral part of the plot. This seems fitting because it's one established band advising a new one. If any band needed guidance and mentorship it's The Archies. Joe Eisma and Matt Herms are a dream team. Eisma seems to love drawing the Archie characters. There's a buoyancy to the visuals that keep the story engaging and appealing. Herms vibrant colors are in keeping with the colorful classic comics of Archie in the past. Here, of course, it's present day and modern but no less fun or accessible. Overall, 'The Archies' features some of the best-looking depictions of the Riverdale gang. 'The Archies' encompasses everything that makes Archie Comics so timeless and fun. It's about friendship and overcoming obstacles both big and small. This issue focused on Archie and Betty but the lessons learned are universal. The appearance of Chvrches only makes it cooler.